The rise in global arms sales that began in the early 2000s continued in 2017. The volume of international sales of major weapons between 2013–17 was 10% higher than in the previous five years, new research from the Stockholm Peace Research Institute (SIPRI) reveals. SIPRI’s report, Trends in International Arms Transfers, 2017, identifies 67 countries as exporters of major weapons in 2013–17. It lists the five largest suppliers during the period as the United States, Russia, France, Germany and China. These five exporters together accounted for 74% of all arms exports in 2013–17. The flow of arms increased to Asia and Oceania and the Middle East between 2008–12 and 2013–17, while there was a decrease in arms going to Africa, the Americas and Europe. 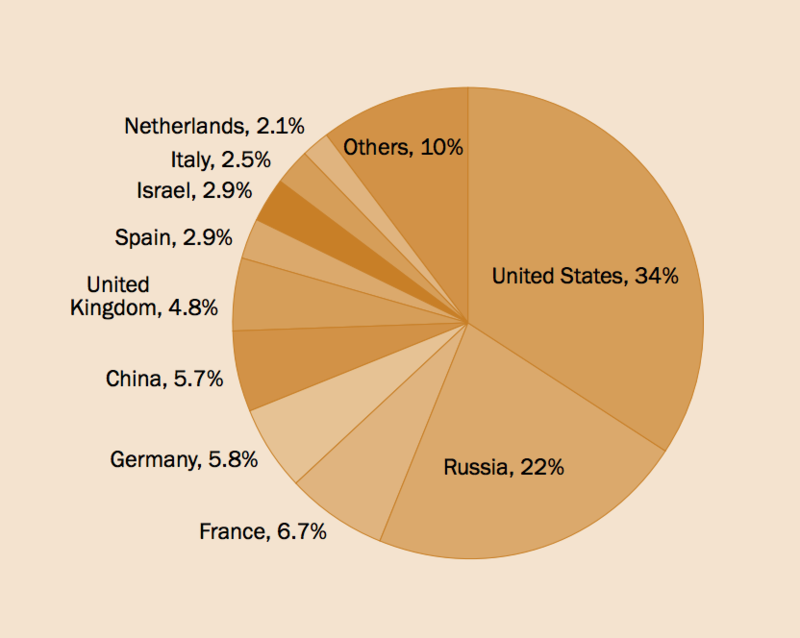 During the five years between 2013–17, the United States accounted for 34% of all arms exports. Its exports increased by 25% between 2008–12 and 2013–17, and were 58% higher than Russia’s — the second largest arms exporter during the period. The United States supplied major arms to 98 countries. Exports to states in the Middle East accounted for 49% of its total arms exports in the period. 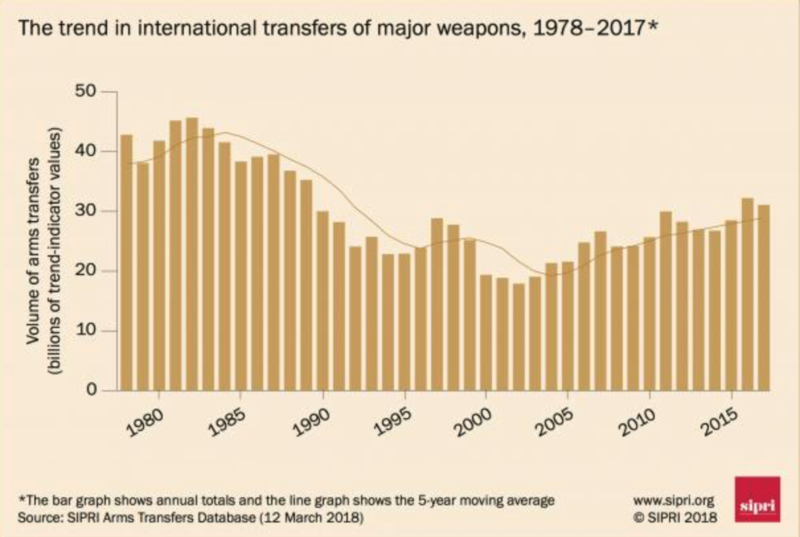 “Based on deals signed during the Obama administration, US arms deliveries in 2013–17 reached their highest level since the late 1990s,” said Dr Aude Fleurant, Director of the SIPRI Arms and Military Expenditure Programme. Exports by Russia decreased by 7.1% between 2008–12 and 2013–17. Meanwhile, France increased its arms exports by 27% between the two periods and was the third largest arms exporter in 2013–17. Exports by Germany—the fourth largest arms exporter in 2013–17—fell by 14% between 2008–12 and 2013–17; however, German arms exports to the Middle East increased by 109%. 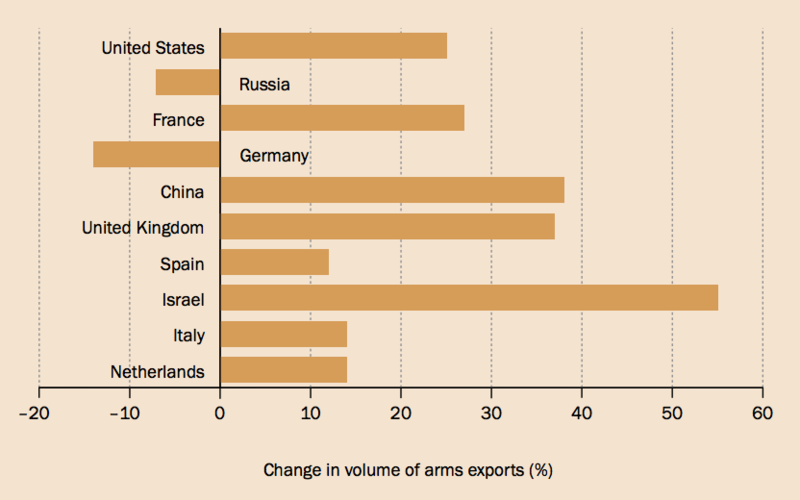 Few countries outside North America and Europe are large exporters of arms. China, however, was the fifth largest arms exporter in 2013–17. Its exports rose by 38% between 2008–12 and 2013–17. While Pakistan was the main recipient of China’s arms exports in 2013–17, there were large increases in Chinese arms exports to Algeria and Bangladesh in the period. Most states in the Middle East were directly involved in violent conflict in the period 2013–17. Consequently, arms imports by states in the region increased by 103% between 2008–12, and 2013–17, and accounted for 32% of global arms imports in 2013–17. “Widespread violent conflict in the Middle East and concerns about human rights have led to political debate in Western Europe and North America about restricting arms sales,” said Pieter Wezeman, Senior Researcher with the SIPRI Arms and Military Expenditure Programme. In 2013–17 Saudi Arabia was the world’s second largest arms importer, with imports increasing by 225% compared with 2008–12. Arms imports by Egypt—the third largest importer in 2013–17—grew by 215% between 2008–12 and 2013–17. The United Arab Emirates was the fourth largest importer, while Qatar (the 20th largest arms importer) increased its arms imports and signed several major deals in that period. 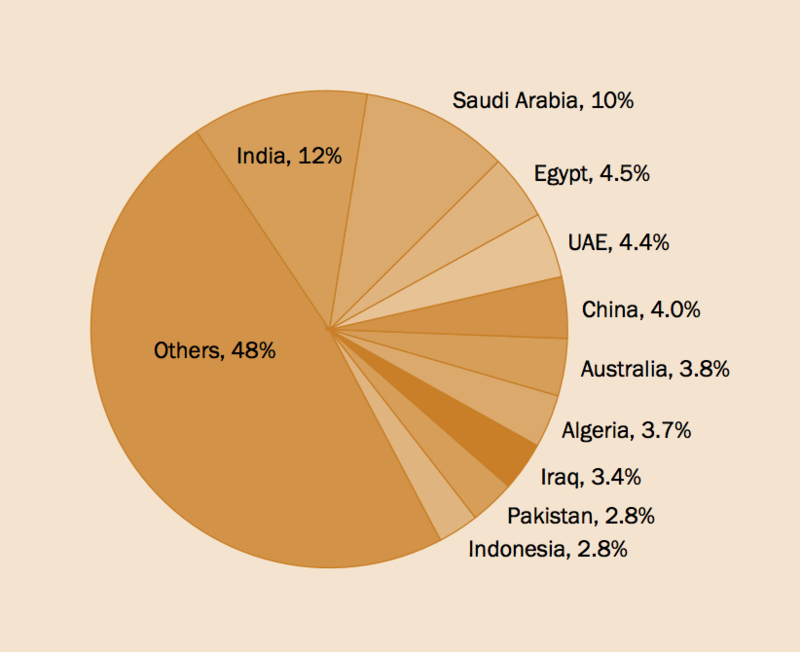 India was the world’s largest importer of major arms in 2013–17, accounting for 12% of the global total. Its imports were up 24% between 2008–12 and 2013–17. Russia accounted for 62% of India’s arms imports in 2013–17. However, arms imports from the US rose by 557% between 2008–12 and 2013–17, making it India’s second largest arms supplier. Despite its continuing tensions with India and ongoing internal conflicts, Pakistan’s arms imports decreased by 36% between the two periods, and its imports from the US dropped by 76% in 2013–17 compared with 2008–12. “The tensions between India, on the one side, and Pakistan and China, on the other, are fuelling India’s growing demand for major weapons, which it remains unable to produce itself,” said Siemon Wezeman, Senior Researcher with the SIPRI Arms and Military Expenditure Programme. China’s arms imports fell by 19% between 2008–12 and 2013–17. Despite this decrease, it was the world’s fifth largest arms importer in 2013–17. 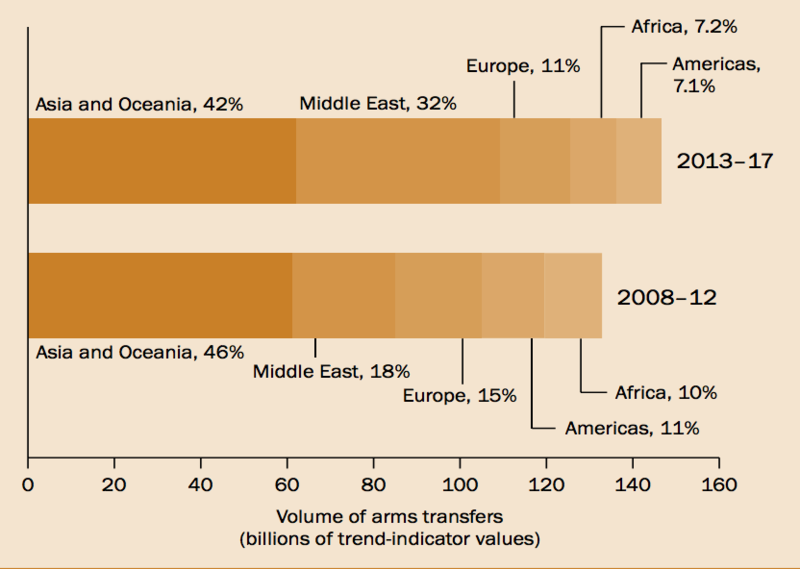 · Arms imports by African states decreased by 22% between 2008–12 and 2013–17. · Algeria accounted for 52% of all African arms imports in 2013–17. · Nigeria’s arms imports grew by 42% between the two periods. · Total arms imports by states in the Americas decreased by 29% in 2013–17 compared with 2008–12. Venezuela’s arms imports fell by 40% per cent between the two periods. · Imports by states in Europe decreased by 22% between 2008–12 and 2013–17. Deliveries of advanced combat aircraft from the US will drive import volumes up during the next few years. · In 2013–17 China accounted for 68% of arms imports by Myanmar, followed by Russia (15%). · Indonesia increased its arms imports by 193% between 2008–12 and 2013–17. 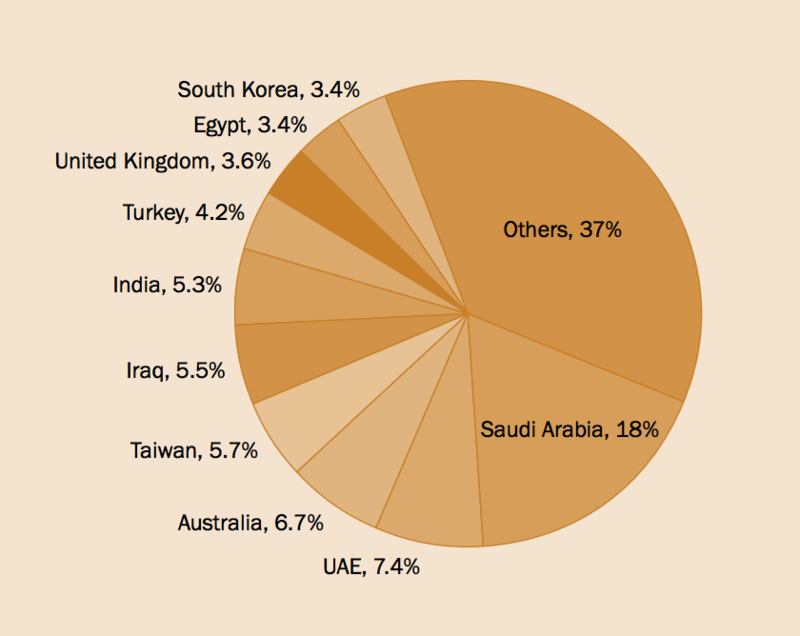 · Australia was the world’s sixth largest arms importer in 2013–17. The free-to-access SIPRI Arms Transfers Database now includes data on arms transfers in 2017 and updated information for 1950–2016.